Violent crime is out of control because too many people don't want to think about it, don't prepare for it, and gamble that they won't be one of the 14,000 victims hurt or killed in America every day. Five out of six Americans will be victims of violent crime during their lifetime. Waking The Tiger Within, (136 pages, plus 32 pages of sharp, related illustrations), describes simply with fresh, unapologetic vigor how to become aware, powerful, never a victim--in control on the street, in the car, at work, on trips, at home and at school. Scott Flint, a 5th degree Black Belt, holds the title of Master Instructor, has taught over 3000 students during 23 years, learned from experience exactly what women, men, and children must know to be safe in all environments. 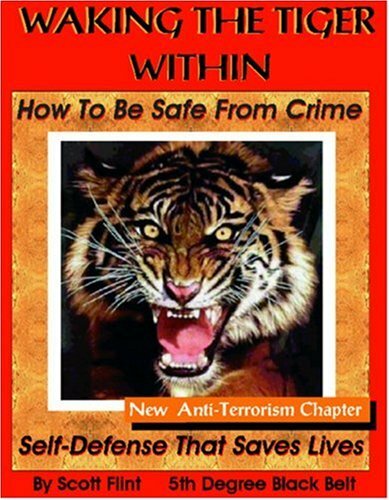 The Foreword first describes the purpose of the book: developing instinctual fighting ability (the Tiger within), and providing simple, common-sense techniques to ensure safety on the street, at home, at work, in the car, on trips, and at school. Next, the Foreword cautions against compassion for "goblins," those who prey upon us, warns that we must expect to be attacked eventually, with on one to depend on but ourselves. The Foreword concludes: "If you learn these principles, you will repel violence instead of attract violence. If violence must be committed, let it be in your defense, and not to your demise." Chapter 1 begins with the assertion: "No one ever has the right to hurt you. The mere thought of someone doing so should make your blood boil, and anyone who attempts to hurt you does so at his own peril." "Your chances of being attacked are directly related to your level of willingness to fight back." The second part of chapter 1 defines exactly what one can do to defend oneself--under the law. Chapter 1 concludes with the thought: Do everything you can to avoid attack, but if it has to happen--strike hard, strike fast and end it on your terms." The chapter opens with the thought: Awareness determines whether one will be attacked or not. Victim’s state: "I couldn't believe it was really happening, it was unreal, I was frozen, I couldn't think." Readers of chapter 2, Awareness, will be able to say instead: "It might happen to me. It might happen today. I know what to do. And I'm going to do it!" Copy the Tiger, be aware. 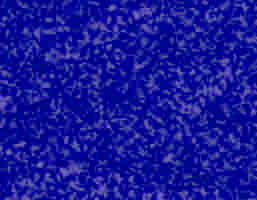 The rest of Chapter 2 tells simply, directly, how always to be aware: practice the "Color Code." White--unaware. 90% of people are in white most of their lives. White attracts assailants. Yellow--general alertness. Potential attackers are repelled by alertness. Orange--specific alert. In orange you make your battle plan. "If he steps one more step toward me, I'll drive my finger into his eye." Red--is the fight mode. You are a machine, your decision and action are automatic, your assailant is surprised, then terrorized. The "Color Code" saves lives, makes the assailant the victim. "Everyone is born with a tiger within," begins Chapter 3. But society buries our Tiger deep within us. When we convert fear to rage, Chapter 3 continues, with the accompanying adrenaline surge, our Tiger surfaces powerfully to save us. Always, Chapter 3 concludes, we must fight back, surprising the predator, converting our fear to rage, making our entire essence as frightening to the assailant as a wild, ferocious Tiger. "Don't fight fair, fight to win." How well we defend ourselves is 90% mental, 10% physical, Chapter 4 stresses in the first section. The rest of the chapter uses 33 illustrations and crisp, simple instructions to teach powerfully effective techniques to end the fight within one second. "Your home is an extension of yourself--an attack on it should infuriate you as much as a direct attack on yourself." Prevention is the key, Chapter 5 continues. The remainder of the chapter describes 12 specific measures to protect the home. After you learn to defeat a single attacker, you can defeat many attackers by using the same technique. "As long as you are fast and brutal in you technique, and escape a soon as you are able, you will survive." Chapter 6 continues with specific techniques to survive a mass attack, and explains how to quickly stop an armed assailant. The chapter concludes with this advice: "remember your advantages and be happy that your assailants are unconfident, distracted fools as you attack their attack. Chapter 7 tells clearly, simply, with illustrations, how to remain safe while walking,driving (road-rage, car jackings), staying at hotels or motels, in a restaurant, in an elevator; and how to be a secure tourist. "300,000 children in the United States are abducted each year, 46,000 never to be found again." To keep your child totally safe, Chapter 8 continues, you must assume your child will be attacked, and that it will happen sooner or later. Actual kidnappings are described in the chapter--those which ended in tragedy, and those rare ones where the child knew what to do, survived. The chapter continues with 14 specific rules and techniques every parent must teach their child to ensure the child's survival. Chapter 8 ends: "If enough children start fighting back against the evils of kidnap and child molestation, the whole business of these perverts hurting children will stop." Chapter 9 begins by describing the harm done to children by bullies. And then it tells the parent how to detect signs that the child is being bullied. The middle part of Chapter 9 warns that, unchecked, bullying always escalates, especially when child and/or parent is in denial. The chapter concludes with the mandate that a child must be taught never to let a bully get away with anything. The child must fight back, over-react to the threat of the bully, and the parent must always support the child's actions 100%. Waking The Tiger Within teaches our children and us how to be safe. Never submit, comply or follow the commands of an attacker. Always we must fight. We must plant firmly in our mind that, yes, if we are attacked, regardless of the odds, we will fight back. When we do this, we are strong, at peace. We have awakened the Tiger within.